And here we go. 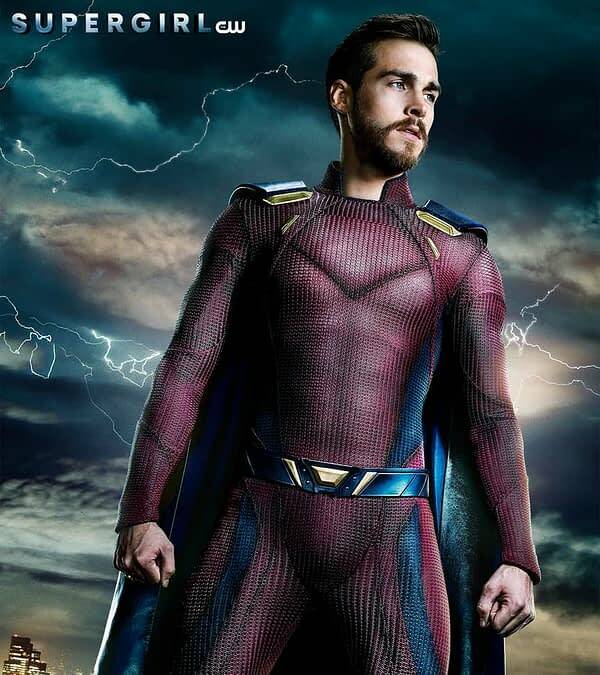 The CW has released the first official look/poster for Mon-El’s new costume, which debuts on Monday, April 23rd. When Mon-El (Chris Wood) was first introduced on Supergirl, he wasn’t a hero by any stretch of the imagination. He was a Daximite prince who escaped the destruction of his planet because one of his guards put him in an escape pod. He lied about that and let Kara (Melissa Benoist) believe he was just a common Daximite, the enemy of the Kryptonians, until his parents Rhea (Teri Hatcher) and Lar-Gand (Kevin Sorbo). Though he and Kara fell in love, to save the Earth she laced the air with traces of lead — not enough to hurt humans but more than enough to kill Daximites. Mon-El left the Earth in his pod and ended up going through a wormhole to the future. He came back this season after spending seven years in the future building up the Legion of Superheroes, teaching them everything Kara taught him… and getting married to Imra Arden (Amy Jackson), aka Saturn Girl. Since coming back he’s been wearing a simple black leather uniform similar to the other Legion members, but this week he admitted to having an older uniform with a cape that needed some repairs. We’ve seen the uniform in a few stills from upcoming episodes, but this is the first official poster of him in the red with blue trim and cape. There is also an area on his chest that seems to be very similar to the Superman/Supergirl logo shape. The costume is much closer to the one Mon-El wears in the comics. No word yet if he will start using the Valor name that he sometimes uses in the comics as well. Supergirl airs Mondays at 8 p.m ET on the CW.